RPG fans have been hoping to see the next installment of The Legend of Heroes: Trails in the Sky, but the sheer scope of the series has made it hard for XSEED to focus on it. Today the company announced they have partnered with Carpe Fulgur, who has been translating the Second Chapter into English. Along with this announcement, XSEED has announced the original title will be available on PC. As someone who hasn’t owned a portable system in many years, this is great as it gives me the opportunity to play this well regarded series. The Legend of Heroes: Trails in the Sky SC is scheduled for release in 2014 for PC and PSP (via digital download, also compatible with Playstation Vita), while the The Legend of Heroes: Trails in the Sky PC port will be out this winter. Torrance, Calif., (September 6, 2013) – XSEED Games, the independent-minded console publishing brand of Marvelous USA, Inc., is pleased to announce a partnership with Carpe Fulgur LLC to bring the much anticipated title, The Legend of Heroes: Trails in the Sky SC, digitally to PC and the PSP® (PlayStation®Portable) system (including compatibility with the PlayStation®Vita handheld entertainment system) in 2014. The first chapter, previously released for the PSP system as The Legend of Heroes: Trails in the Sky, will also be released for PC this winter. The result of a near endless deluge of fan requests to XSEED Games after the company released the first chapter on the PSP system in 2011, this will mark the debut of the English version of The Legend of Heroes: Trails in the Sky on PC, as well as the first release of the English version of The Legend of Heroes: Trails in the Sky SC anywhere. The two chapters will release as two separate, back-to-back installments. Developed by legendary RPG specialists Nihon Falcom, the multi-part story told in The Legend of Heroes: Trails in the Sky represents an entirely new stand-alone entry in the timeless The Legend of Heroes series. In The Legend of Heroes: Trails in the Sky, players venture through the diverse landscape of the Liberl Kingdom, experiencing its unique traditions and cultures along the way and shaping the world itself with their decisions. 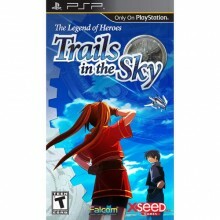 The Legend of Heroes: Trails in the Sky opens in the quaint and peaceful town of Rolent in the Liberl Kingdom. Home to a peacekeeping coalition free of government ties known as the Bracer Guild, the adventure follows two young aspiring bracers known as Estelle and Joshua on their trials to become full-fledged members of this elite organization. As they embark on their quest, their journey will take them across an entire country, unraveling a sinister government conspiracy along the way that’s poised to overtake the throne, threatening the very peace the bracers seek to uphold. Throughout their adventure, players can expect to learn the full depth of these characters’ origins and motivations through dialogue-driven cutscenes and lengthy side-quests.